I have a confession to make, friends. I’ve been lying to myself since January. That’s when all of our New Year’s resolutions come due, right? Well, since then, I’ve been talking and blogging about self-love. And while I get massages and I relax and I garden and I eat better and all the rest…it was only recently that I understood what self-love really meant. Self-love, turning inward and fully looking at and understanding oneself, is a challenging practice. We have to be willing to see it all, up close and personal, without judging ourselves. That’s the tricky part…to see where we make bad decisions and to accept that we chose what we did without hating ourselves for it. To forgive ourselves for not taking better care of our bodies, minds, hearts, whichever the case is. And in that forgiving, we can clear a space to make changes. To let go of the old and embrace the new. To incorporate what we do want in our lives. And if we do love ourselves, our lifestyles should empower and energize us. We should live in ways that make us feel vibrant, healthy, and alive. I’ve given up a number of addictions this year, from consuming too much sugar, to sneaking a cigarette or two while the baby was sleeping, to a whole range of self-defeating thought patterns. We tell ourselves all sorts of lies, don’t we? “I hardly even smoke.” “It’s just one or two cookies.” “It’s just one slice of pizza, who cares?” “I’ll start working out on Monday.” Does that Monday ever really come? Our minds will fight with us. The mind, or the ego, wants to keep running its program, it wants to keep doing what it knows. The mind wants us to stay comfortable. And this is where I really learned the lessons that kicked it all into gear for me: I kept waiting for it to be easy. Guess what, it’s not! But that doesn’t mean we give up on ourselves. Living an unhealthy lifestyle is hard in ways and changing yourself for the better is hard, in other ways. Pick your hard. Dropping an addictive behavior is actually rewiring your mind to make new choices. To live in a new reality, as a new version of yourself, every day. It’s fighting against the thoughts that pop up constantly, telling us that we can’t do it. We can! You can do it! If I can, then you can too. 1. Be Honest With Yourself – Honestly look at your life and at the decisions that you make. Only in seeing the ugly truth, all of it, can you begin to change. Don’t hold back. 2. Plan it Out – Choose a lifestyle change to focus on. If it’s healthy eating, for example, than plan for it. Write it down. There are countless tools on the Internet to help you. If you like meal trackers, well, I’ve tried just about all of them over the years and the best one, as far as I can see, is My Net Diary. I bought the app for my iPad and never looked back. It does it all and doesn’t sell you a thing. Make a foolproof plan…choose what foods you will cut out and choose what you will eat. Plan and prep your meals ahead of time. Set yourself up to win, make it as simple as you can. 3. Build Support – Friends that understand you, that are also improving their lives…are gold. We all know the type to talk us out of positive changes: “what, you? Yeah, good luck.” The eye-rolling, the chuckling, the sabotage, “come on, it’s chocolate! Indulge a little!” They want to keep us in place, mostly because they don’t want to change. And that’s okay. Get some distance from them. But friends that empower you on your journey are priceless. Set up a foundation of support because there will be times when you’ll want to go back to your old ways. Or punch things. But having that friend or two to check in with, to gain support from, is so powerful and will help you see things through. 4. Reminders – I have boards upon boards in my bedroom. My workout schedule, with big smiley faces next to completed workouts. The baby’s schedule. Meals for the week. And inspiration, as well. Place visual reminders somewhere that you’ll see them, every single morning, to shortcut that stubborn brain from derailing you. Set your intentions early: this is who I am, this is what I’m eating, this is when I’m working out…and this is why. The “why” is so important. For me, it’s my son. Don’t I want to live a full and healthy life, keeping up with his activities, playing sports, providing good behavior and healthy standards for him to follow? Of course I do. Find your why — it can be a tangible goal like planning for a wedding day or a vacation or wanting to have a baby or…just keep it nice and simple. Be the best version of yourself possible, because you’re worth it. That can be “why” enough. You are worth the effort! 5. Celebrate Milestones – Lost your first ten pounds? You rock, that’s awesome! Just ran a 5K? Wow, you’re amazing! Keep going! Acknowledge yourself and honor yourself along the way, the same way you would for a friend. 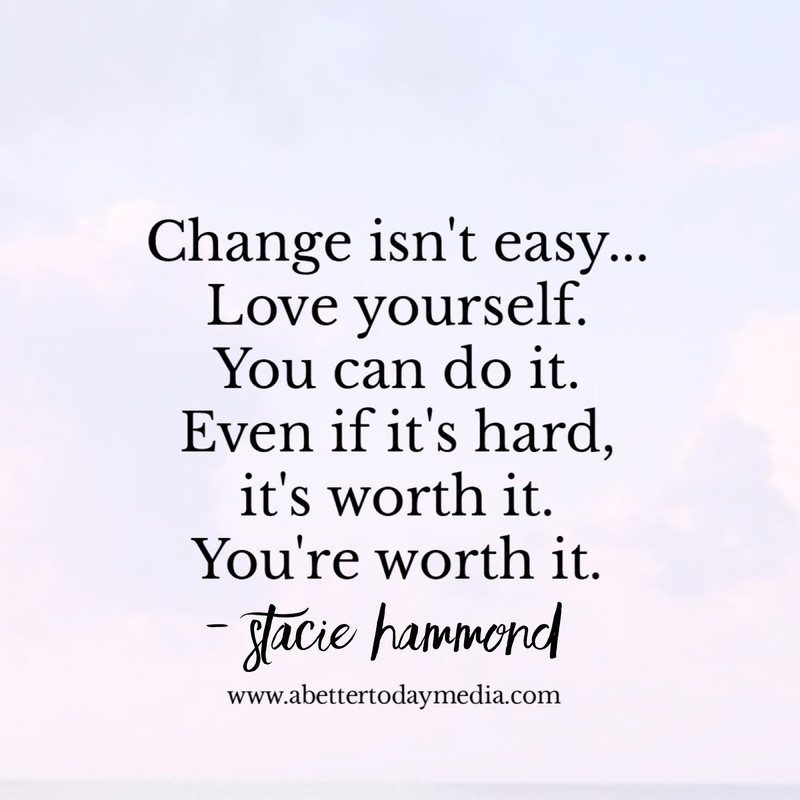 Changing your life isn’t easy! Monitor your progress and love yourself for it. Know the changes that you want to make. Plan for them. Get support, stay focused, and celebrate your milestones. Change isn’t easy but it’s absolutely possible. Two years ago I was nearly 100 pounds heavier, was riddled with chronic low-back and joint pain, I had high triglycerides and was in danger of going on statins, (no!) I rarely exercised and I smoked a few cigarettes every day. Today, all of my bloodwork is perfect and I never took that medication. I am a non-smoker now. I am virtually pain-free, with the help of my chiropractor and massage therapists. I am not saying this to brag, or toot my own horn, so to speak…but merely to show you the power of the body to heal itself, if we get out of the way. If we treat ourselves the way that we’d treat innocent children…ensuring proper nutrition, rest, play, and love…we’ll be in good shape. Love yourself. You can do it. Even if it’s hard, it’s worth it. You’re worth it. Spread motivation ~ share this on Pinterest!